Happy July, y’all! You know what the first Friday in July means, right? Yessiree! It’s giveaway time here at The Mailbox Blog. This month five participants will be randomly selected to each receive a Mailbox bag like the one shown in the photo. In addition, each bag will contain a surprise! Hot dog! 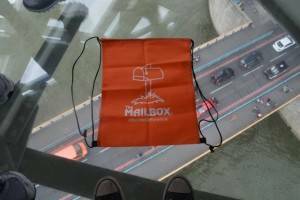 This Mailbox bag has gone international! It’s resting on the glass walkway at the Tower Bridge in London. Check out the cars below that are crossing the Thames River! And speaking of hot dogs, did you know July is National Hot Dog Month? Well it is. In fact, the National Hot Dog and Sausage Council estimates that over seven million—SEVEN MILLION— hot dogs will be eaten by Americans this year between Memorial Day and Labor Day. That’s a lot of hot dogs! To be entered in this month’s giveaway, tell us one of your favorite summertime foods. Maybe it’s a hot dog, or maybe it’s not. Leave your answer right here on the blog before midnight on July 10, 2016, and you’ll be automatically entered for a chance to win! I’m going with fresh peach cobbler! Summer salads with fresh veggies, or fresh fruits. Nothing better. Two things. Ice cream as it trickles down the cone as you leave the shop. You madly try to lick it into a dome in the summer heat only partially succeeding leaving your fingers sticky and warm. And secondly, the slurp of fresh red watermelon cut into quarter slices , the sound and laughter of children spitting the seeds into the air knowing they are allowed to do the forbidden. Fresh fruit such as watermelon and peaches. As well as food cooked on the grill along with potato salad! Fresh fruit and my brothers watermelons always cut in to something creative. My sons pig roast in August is the best with pig and lots of people bringing all kinds of salads and desserts. You have to watch what you eat for a week to make up for it. I love anything grilled!!! Or fresh fruits and vegetables! I love salad, blueberries from our bushes, and hot dogs in the summer. One of my favorite summertime meals is orzo with roasted vegetables, garlic,onions and fresh herbs. I sometimes add diced turkey ,chicken or both. My favorite is a watermelon cut out with fresh fruit inside. It is the best on a hot day! Happy 4th of July ??? My summer favorite foods are everything that can be grilled from hotdogs, to veggies! My favorite summertime food is watermelon and all the fresh fruits! Also lots of BBQ’s! Love fresh fruits and veggies: cucumbers, melons, corn, strawberries. My favorite summer foods are fresh pasta salad with crunchy veggies and sweet corn from the midwest slathered in melted butter and sprinkled with salt! DELICIOUS! My favorite summer food is my mom’s home made macaroni salad. I still haven’t been able to master the recipe to make it taste as good as when she makes it. My favorite food, really is Nathan Hot Dogs, but since I live in Chicago I have to purchase them at nearest grocery store. Berries; by themselves or with granola and yogurt! My favorite foods for summer are….homemade ice cream…steaks on the grill…ice cream cones from a variety of places…fresh fruits and vegetables….I had better stop! Fresh veggies from the garden….Nothing like it! Home grown tomatoes on a BLT! Definitely watermelon! I could eat it all day, everyday! Favorite summer foods-watermelon and Popsicles! My favorite summer foods would have to be fresh picked corn on the cob, strawberries, cantaloupe and iced tea….I’m hungry now! BBQ chicken on the grill!! Berries! Strawberries, raspberries, marionberries, huckleberries… ALL OF THEM! Potato Salads of many variations! Fresh heirloom tomato sandwich on sourdough bread! I love grilled corn on the cob with mayonnaise and parmesan cheese. I can eat that every day! but of course once the grill is on there are some other goodies to add like a steak and some veggies. Pineapple and peaches are so delicious on the grill. Ugh, I’m hungry now. Fresh tomatoes from the garden, still warm from the summer sun! Yum! I LOVE fresh corn on the cob with butter and salt! Shave ice as we call it in Hawaii; snow cones elsewhere. Whatever it’s called, crushed or shaved ice piled in a paper cup or cone drenched in a delicious sweet syrup like lilikoi(passion fruit) or strawberry is definitely a summer treat. In Hawaii, it’s an everyday, every month treat! My favorite summer food is grilled asparagus! Yum!! My favorite summer time foods are going to the Amish and buying fresh vegetables to bring home to cook. Plus a watermelon. My favorite summertime food, fresh corn on the cob! Cedar Crest caramel collision ice-cream! Fruit salad the old fashion way! Apples, oranges, grapes, cherries, bananas, pecans and mini marshmallows! Yum! Corn on the cob. Yum! Yum! Yum! Grilled corn on the cob. Delicious! Ice cream and anything from the grill! Anything eaten hot off the grill or fresh out of the garden are summertime favorites! Summertime taco salad always hits the spot, especially when made with homegrown tomatoes and lettuce. I love grilled bbq steak, fresh tomatoes from the garden in a chicory salad, and chilled watermelon. Also, nothing beats eating an ice cream cone, while walking along the boardwalk. Watermelon and fresh tomatoes are two of my favorites. Marathon Dessert! It’s a yummy layered ice ream dessert that is a favorite of my whole family! My favorite summertime food are fresh fruit and vegetables from the garden. Salads and plenty of ice cream and homemade milkshakes. Plus, I can’t forget family picnics and church fellowship luncheons and friend get together lunches ,A taste of everything that you may forgotten. during the school year. Grilled hamburgers, corn on the cob, fruit salad, and ice cream. Hometown favorites… Speedies and Salt Potatoes. I love the fresh fruits of summer. Barbequed anything-hotdogs, hamburgers, steaks, veggies, etc. Also corn ? on the cob! Yum!! Nice cold watermelon!!!!!! Ice cream comes a close second. My favorite summertime food is ice cream! I love to barbacue steak and mushrooms with baked potato. Then have an ice cold coke. Fresh veggies picked from our garden and made into a salad!